In a tunnel nearby, Casey regrets coming to Survive the Night, the all-night underground rave in the New York City subway. Her best friend Shana talked her into it, even though Casey just got out of rehab. Alone and lost in the dark, creepy tunnels, Casey doesn’t think Survive the Night could get any worse . . . . . . until she comes across Julie’s body, and the party turns deadly. Let me just start out by stating my obvious draw to this novel: The cover! I know you're not supposed to judge a book by it's cover(but c'mon, we all do at some point!) but how could I not want to read this when I see that colourful and totally badass cover?! Alright, now that that's out of the way, let's talk about why this book totally lived up to it's epic cover. I used to love R.L. Stine as a kid, but for some reason, as I got older, my love for the horror genre with books has fizzled. I've read the odd Stephen King novel, but aside from that, it hasn't really wowed me...Until now! Danielle Vega came with a bright, burning match and re-ignited my passion for the horror/thriller genre! She lit that sucka up! My arc copy of this novel has tea stains, food stains and sweat stains all over because I simply could not put it down! I devoured it a the gym(that explains the sweat stains) and thumbed through it on my tea breaks at work and read while I was downing any meal. I. Just. Couldn't. Stop. Reading! Danielle Vega introduces us to Casey, a high school girl that has just been released from rehab for an addiction to her pain killers that were prescribed to her after a soccer injury. Her best friend Shana is the one people are quick to blame for Casey's new and wild life. Shana, you could say, is just a tad on the crazy side! 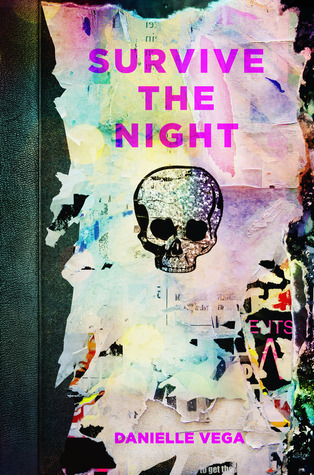 Shana, Casey and their group of friends find themselves at a rave, Survive the night. That, of course, is held underground, in old subway tunnels that have long been out of service. You are not allowed to leave the rave until the night is over...Obviously that is a recipe for disaster. It doesn't take long for blood to be spilled and body parts to go missing. Danielle Vega did an amazing job a turning my stomach. I LOVE horror movies and can handle my fair share of gore. It takes a lot to give me the heebee-jeebees but Vega succeeded and then some. Eyes balls, intestines and rats, oh my! This novel was a total win for me. Any uncertainties I had about this book were slashed(like what I did there?) almost immediately! I have not read Merciless by Danielle Vega but you can bet that I will be heading out to the Bookstore to get it! Dark, gruesome and even a little bit romantic Survive the Night restored my love for the horror genre! Bravo, Danielle Vega, bravo! Đầu Đĩa CD | Ban Dau CD Denon chinh hang, giá tot cho moi nha.